Production in most parts of the Dhaka Export Processing Zone (DEPZ) in Savar remained suspended throughout the day yesterday as clashes between workers and police left at least 100 people injured. The fighting broke out as police charged baton on the garment workers fuming over unconfirmed reports that one of them was killed Thursday over the theft of a cellphone set. Several hundred workers of Featherlite Ltd massed at the entrance to the DEPZ Extension at around 7:00am, clamouring for recovery of the co-worker's body. As the law enforcers prevented them from entering, they marched towards the DEPZ (old). On the way, they were joined by a huge number of fellows from the other factories. In the old DEPZ area, police clubbed them, leaving several workers injured. In response, the demonstrators went on the rampage, damaging a number of factories in and outside the exclusive industrial block. Besides, they barricaded the nearby Nabinagar-Kaliakoir Road and vandalised seven to eight vehicles, emptying traffic out of there. A-One, Hoplun, Lenny Fashions Ltd and Actor Ltd are among the factories damaged inside the DEPZ area. Chase and counter-chase went on for hours. Police used baton again injuring 40 more. Some 10 cops were also wounded. Police had to shoot around 35 teargas canisters to drive off the marauding crowd. They arrested two--Iliyas and Monir--during the clashes. Due to blockade on the road and the fight, most of the garment workers could not join work, leading to suspension of production in most of the factories. Only 17 out of 88 factories were operative during the time when RMG plants in the nearby areas too remained closed fearing backlash, said DEPZ sources. Locals said workers at the Featherlite Ltd erupted in protests Thursday afternoon after 'rumours' spread that the factory authorities had killed Helal, a worker, for stealing a phone set and hidden his body. Failing to know Helal's whereabouts till late in the evening, they started vandalising the factory building. Informed, Ashulia police got to the scene and had the situation under control. They sifted through the factory premises for the "body" or evidence, but to no effect. The protesters, however, claimed that a bloodstained shirt had been recovered during the search. Motiur Rahman, assistant superintendent of police, told reporters that the story of killing Helal and dumping his body has turned out to be false. “Still, we are trying to trace him [Helal],” he added. A huge contingent of police and the Rapid Action Battalion were deployed in the area while the army personnel were patrolling the roads to avert further violence. A case was filed with Ashulia Police Station against 100/150 unnamed garment workers on charge of vandalism and obstruction to the law enforcers on duty. Police and intelligence men were raiding different places across Ashulia and Savar, police sources said at around 12:30am. 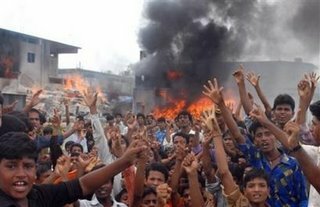 Rioting at RMG plants in and around Dhaka for eight weeks last year left nearly 400 factories damaged. Industry observers believe this has been one of the reasons for the growth in the ready made garment sector slowing down in recent months. A memorandum of understanding (MoU) was signed on June 12, 2006 between the government, garment owners and worker leaders to ensure labour rights, and peaceful and improved working conditions. More strikes and riots in Bangladesh- garment workers take the offensive again!